Looking around the internet there are a lot of cute pins out there. 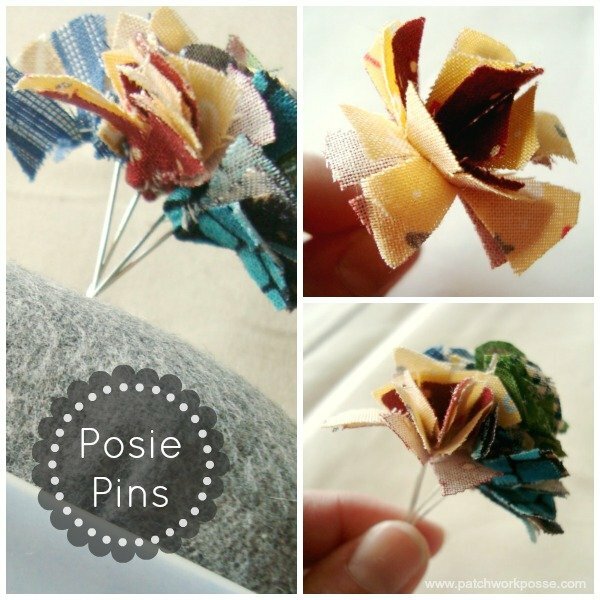 I came up with a little flower pin topper– a posie flower. 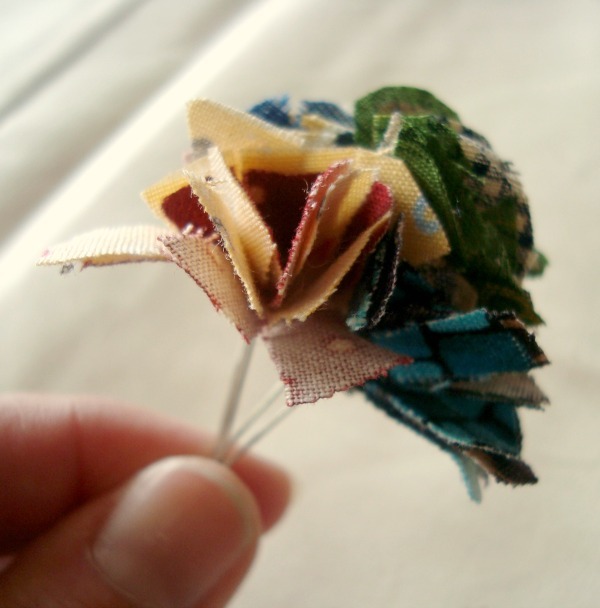 Made with fabric scraps and a few quick stitches and you will in no time have a whole bundle of them! Whether or not they are useful, who cares….. they are cute standing there on the pincushion. That is their job. Cuteness. 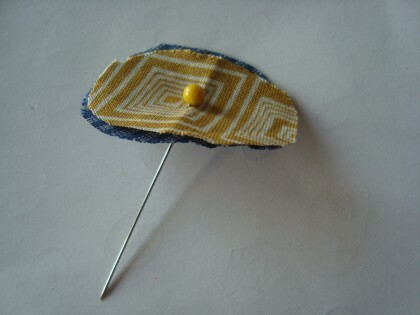 They would make a great addition to any pin cushion you have around, or for a little something extra as a gift. * pins. round heads are great. 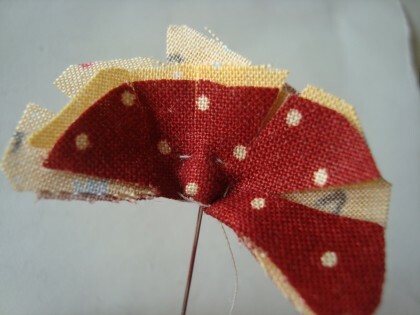 1) Cut 2 pieces of scraps into a circle or oval shape….. around 1 1/2 inches wide and 1″ tall. Nothing patterny here. Just eyeball it. It will turn out just fine. 3) Fold the 2 pieces up and hold in place while making a few stitches around the ball head. This will keep the fabric in place. Knot it at the end. 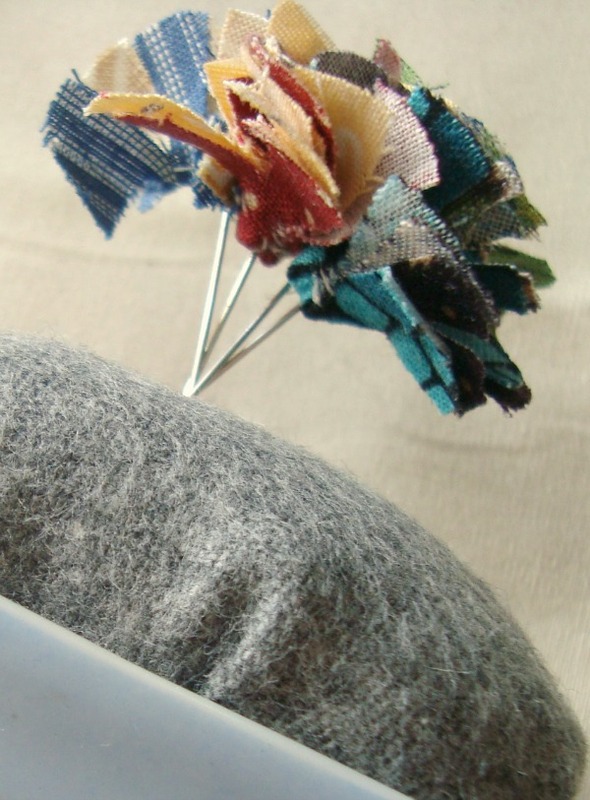 You can use matching thread or try invisible– if you are doing a few with lots of different colors. 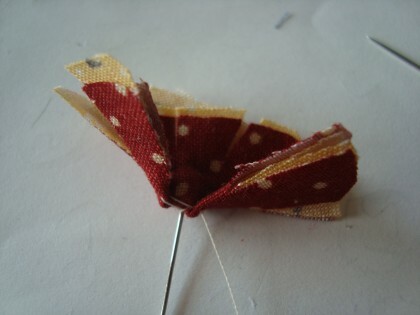 If you can keep from snipping the thread in the next step you can leave the thread, easier for step 5. 4) Snip the edges of the 1/2 circle. See photo above. 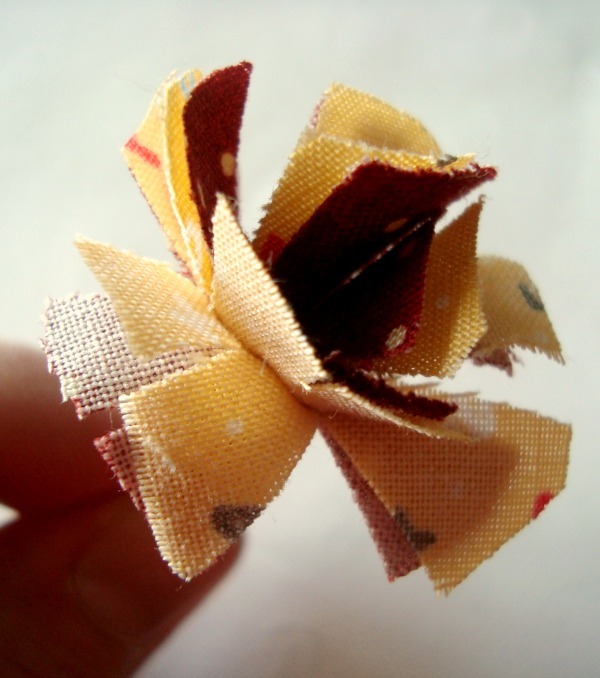 5) Take the two outside edges and fold them to the center. Make a few stitches here to keep them together. Pull it tight so they meet togeher. Knot the thread and snip. 6) Fluff the raw edges a bit to loosen them up and have them ravel a bit. Cute stuff huh?! And no polin, sniffing noses, or weepy eyes even. Perfect for any stitcher. I just found your site! These are too cute… I like you fabric postcards as well. I will have to get in on your next swap! Stop the cuteness! So easy and fun. Pinning for my next scrap basket clean out!